After spending almost 35 years on this planet I have realized that nothing else defines Canadian identity or character more than winter. The harshness of winter brings out the best in us Canadians, you see it everywhere. People pulling over to help others in need, pushing cars out of snowbanks or just giving them a warm place to sit until help arrives. Winter truly unifies the nation because Canadians don’t survive winter alone – they thrive in it together. 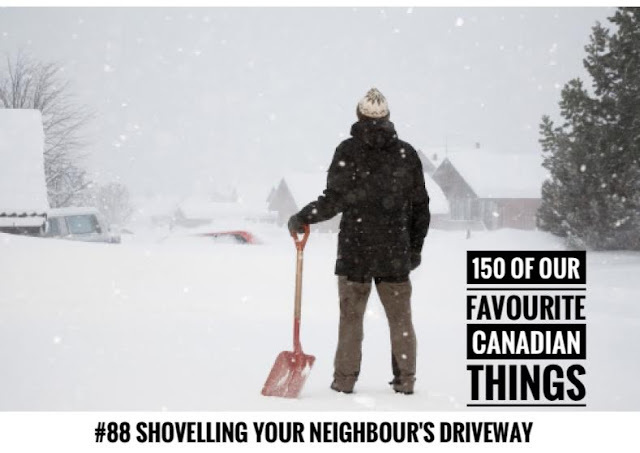 One of the finest acts that a Canadian can commit during the harsh Canadian winter is shoveling a neighbour's driveway or walkway . It’s a beautiful moment when a friendly neighbour shovels the snow off of your drive after a winter snowstorm. Swaddled in snow-packed mitts and salty boots, they’re just lending a helping hand of kindness and some friendly season’s greetings. Don't forget to shovel it forward this winter, it is the Canadian way.